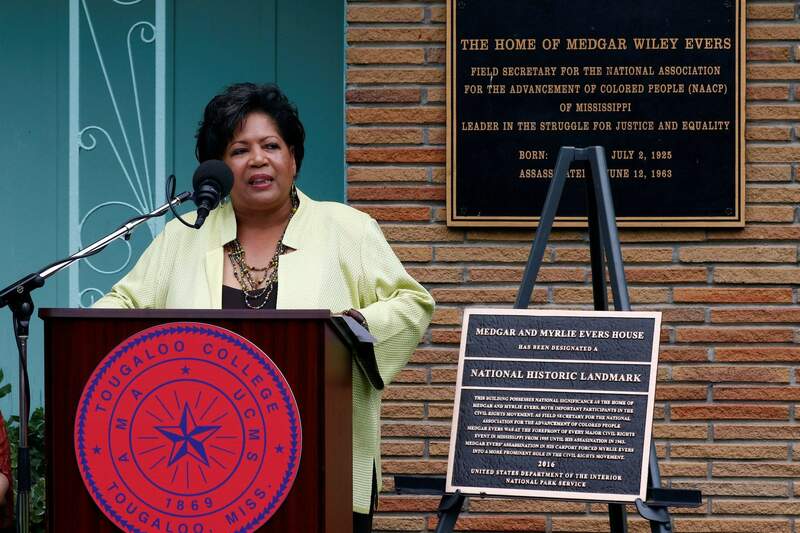 The National Park Service unveiled a bronze plaque, unseen, showing the Jackson, Miss., home of civil rights leaders Medgar and Myrlie Evers, as a national historic landmark, Thursday. As the Mississippi NAACP’s first field secretary beginning in 1954, Medgar Evers led voter registration drives and boycotts to push for racial equality. He was assassinated in June 1963 outside the family’s modest ranch-style home. Reena Evers-Everett, daughter of civil rights leaders Medgar and Myrlie Evers, delivers reflections on behalf of her family before the National Park Service presented a bronze plaque, right, showing the Jackson, Miss., Evers’ home as a national historic landmark Thursday. As the Mississippi NAACP’s first field secretary beginning in 1954, Medgar Evers led voter registration drives and boycotts to push for racial equality. He was assassinated in June 1963 outside the family’s modest ranch-style home. 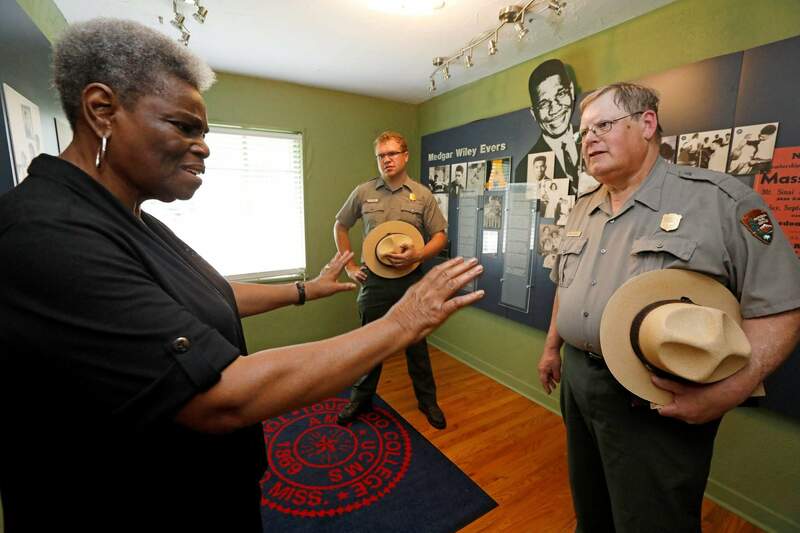 Minnie White Watson, curator of the Medgar and Myrlie Evers house in Jackson, Miss., left, tells Bill Justice superintendent of the Vicksburg National Military Park, right, and U.S. National Park Service Ranger Scott Babinowich, center, about the various times when the house was shot at Thursday in Jackson, Miss. As the Mississippi NAACP’s first field secretary beginning in 1954, Medgar Evers led voter registration drives and boycotts to push for racial equality. He was assassinated in June 1963 outside the family’s modest ranch-style home. The National Park Service unveiled a bronze plaque showing the home of the civil rights leaders as a national historic landmark. 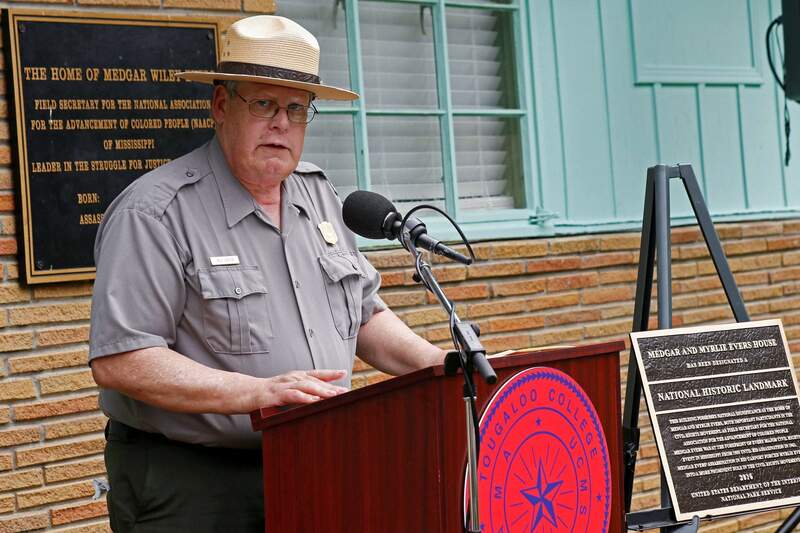 Bill Justice, superintendent of the Vicksburg National Military Park, representing the U.S. National Park Service, presents the bronze plaque as a national historic landmark, right, at the Jackson, Miss., home of civil rights leaders Medgar and Myrlie Evers. As the Mississippi NAACP’s first field secretary beginning in 1954, Medgar Evers led voter registration drives and boycotts to push for racial equality. He was assassinated in June 1963 outside the family’s modest ranch-style home. Reena Evers-Everett, daughter of civil rights leaders Medgar and Myrlie Evers, delivers reflections on behalf of her family before the National Park Service presented a bronze plaque, unseen, showing the Jackson, Miss., Evers’ home as a national historic landmark. As the Mississippi NAACP’s first field secretary beginning in 1954, Medgar Evers led voter registration drives and boycotts to push for racial equality. He was assassinated in June 1963 outside the family’s modest ranch-style home. 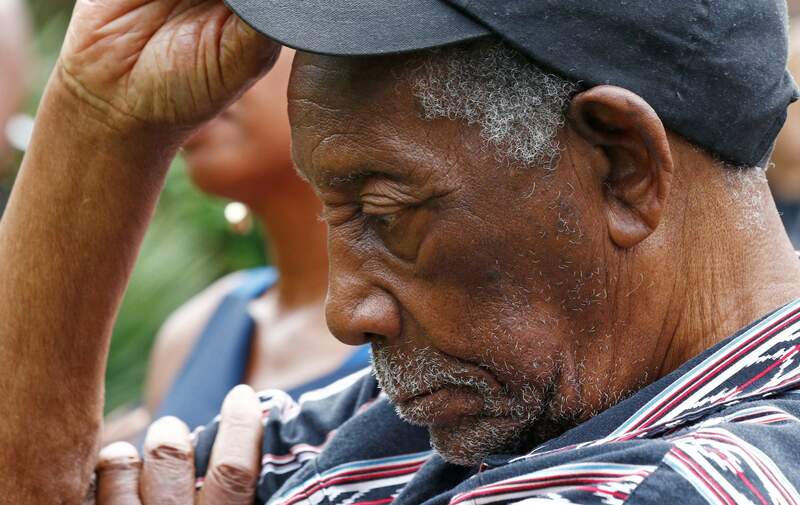 Charles Evers doffs his hat as an invocation is given during the National Historic Landmark dedication of the Jackson, Miss., home of his brother civil rights leaders Medgar and Myrlie Evers. As the Mississippi NAACP’s first field secretary beginning in 1954, Medgar Evers led voter registration drives and boycotts to push for racial equality. He was assassinated in June 1963 outside the family’s modest ranch-style home. 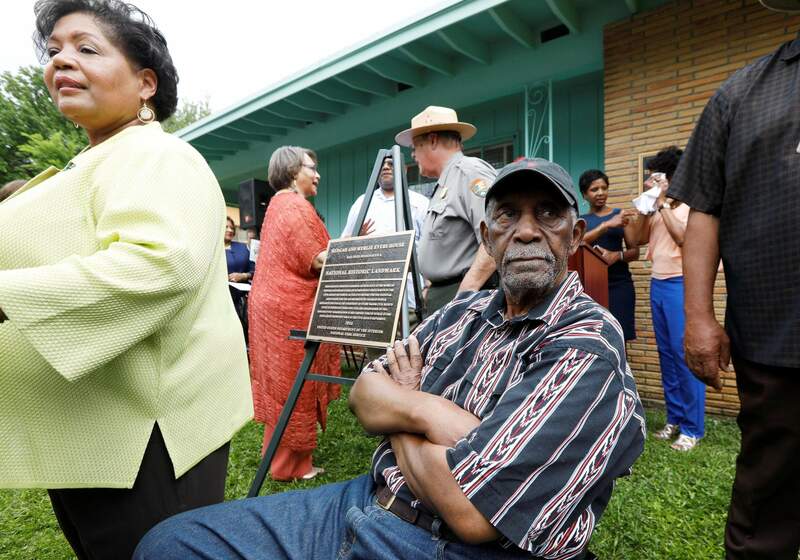 Charles Evers, right, watches as people mill around the front yard of the Jackson, Miss., home of his brother, the late civil rights leader Medgar Evers, after the National Park Service unveiled a bronze plaque, center, showing the Jackson, Miss., home as a national historic landmark As the Mississippi NAACP’s first field secretary beginning in 1954, Medgar Evers led voter registration drives and boycotts to push for racial equality. He was assassinated in June 1963 outside the family’s modest ranch-style home. 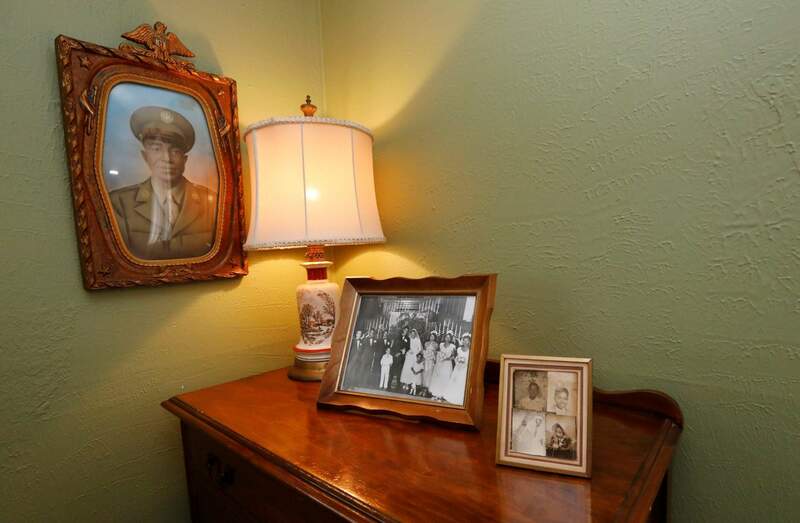 Family photographs decorate the master bedroom in the Jackson, Miss., home of civil rights leaders Medgar and Myrlie Evers, where the National Park Service unveiled a bronze plaque showing the house as a national historic landmark. JACKSON, Miss. 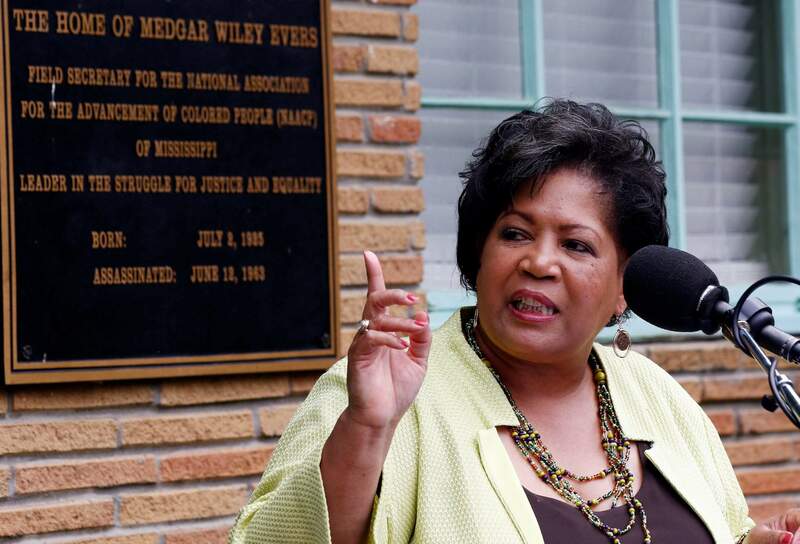 – The National Park Service has unveiled a bronze plaque showing that the Mississippi home of civil rights leaders Medgar and Myrlie Evers is a national historic landmark. More than 100 people, including the couple’s friends and relatives, gathered for a ceremony Thursday outside the home. Medgar Evers was a World War II veteran who fought in Europe and returned to his native Mississippi to again face harsh segregation. As the first field secretary of the Mississippi NAACP beginning in 1954, he led voter registration drives and boycotts to push for racial equality. He was assassinated June 12, 1963, outside the family’s modest ranch-style home. Myrlie Evers was national chairwoman of the NAACP from 1995 to 1998. After living in Mississippi in recent years, she moved back to California, where she raised her three children after their father’s death. The Interior Department approved the landmark designation in 2016 and announced it last year. State and federal officials are also pushing for the home to become a national monument, which would provide further protection. The Evers family donated the home to historically black Tougaloo College in 1993, and it is open by appointment for tours. The three-bedroom home stood vacant for years after the family moved away in the 1960s, and it was restored in the mid-1990s. It is now filled with midcentury furniture, and one of the bedrooms has a display about the family’s history. A bullet hole is visible in a kitchen wall. Medgar Evers was a mentor for Tougaloo students, including some who were arrested in 1961 for their sit-in challenging segregation in the main public library in Jackson. Follow Emily Wagster Pettus on Twitter: http://twitter.com/EWagsterPettus. .